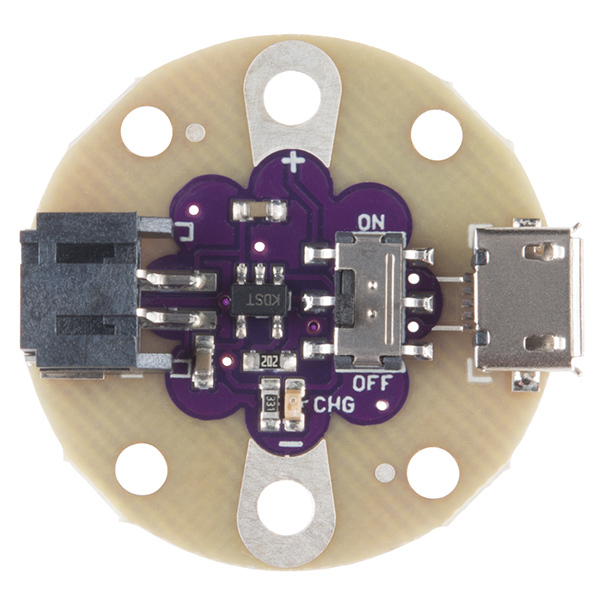 The LilyPad Simple Power is a simple e-textile board with a 500mA charge rate that lets you connect and charge a lipo battery and switch it on or off, that's it! 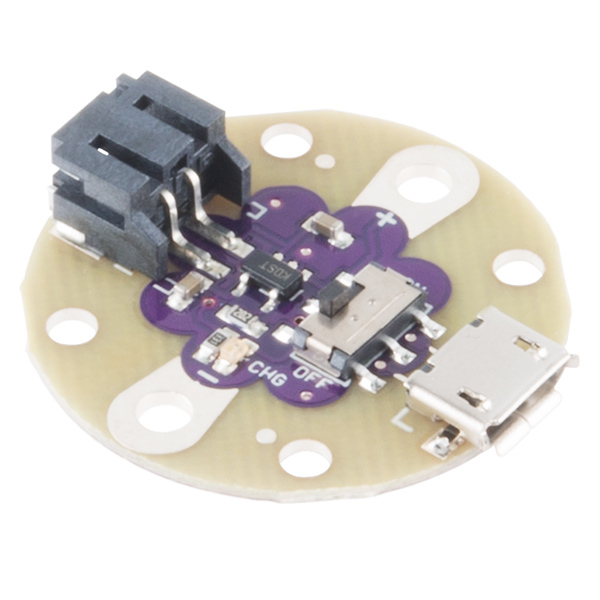 We provide you with a JST connector and a slide switch, you supply the battery and sewing skills! 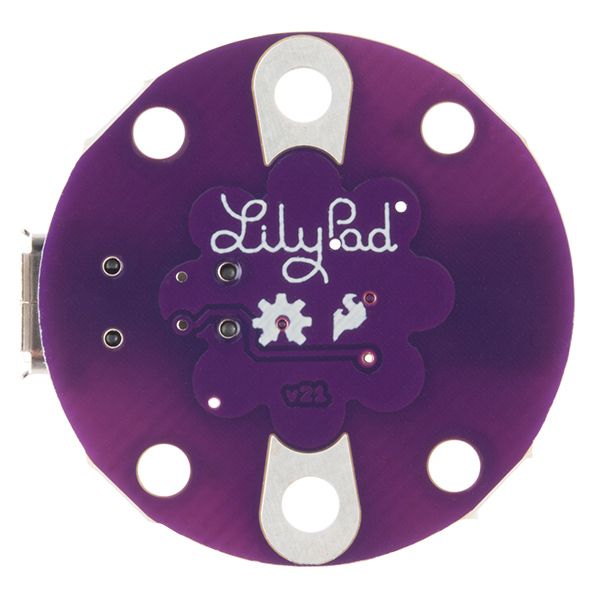 With this LilyPad Simple Power, you should find no trouble in added a bit of power to your next wearable circuit. Default charge rate is 500mA. You should be careful of what LiPo battery you choose. It's not good to have a lower capacity battery and charge the LiPo at a higher rate. Am I misreading the schematic, or does flicking the switch short out the battery? Whoa, I don't think you're reading it wrong. Hopefully its just a documentation error. If it is an error, it's in the Eagle files and - as far as I can tell, one trace goes underneath the mcp - in the product shots as well. Edit: and looks like it's been there since the rework on april 3rd, probably accidental as both signals are named GND and the polygon fill happily bridges the switch pad 'GND' with the actual GND. Should be a relatively easy fix if you receive this board - cut the traces between the switch pad and the little fills next to it. That is, unless we're missing something. True, still makes me question their review process though. I mean this should have been caught by the simplest technical review. Hopefully they can do the temp fix in-house before they ship em out just to keep up the level of service. Sorry about that guys! Believe it or not, this did go through several rounds of protos, QC checks, and simply wasn't caught. On the other hand, we did discover these boards are pretty current limiting when turned off- not a single battery popped during testing. We're getting them fixed in house - again, we're lucky to see what awesome customers we have. Thanks for keeping us honest! Is it fixed now? the schematic still shows that both terminals of the battery get shorted to ground when the circuit is turned off. I just ordered one of these prior to reading the comments. Shorting a Lipo and having it pop on a WEARABLE piece of technology is not something that should be an oops moment. This can do some serious damage to someone if this product matches the schematic and is left up for sale. 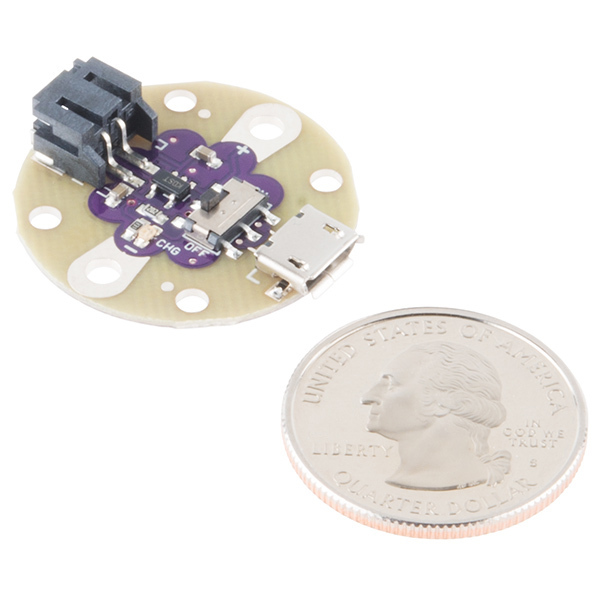 Edit (5.13.2015): Contacted Sparkfun about the issue, this is their response. "All boards that are going out are being fixed in house. We are cutting the appropriate trace before they are being shipped to customers. WE are currently working on a board revision that will not require that modification." It did get fixed, the files just didn't get updated. It looks like our autonotify for the pcb swap didn't trigger correctly for us to update the files. Those should be updated momentarily. Sorry about that!